Electrical utilization permission is required to monitoring and controls on activities of electrical utilization for safety point of view. Electrical utilization permission is system that deploy in the internal management system for safety purpose, the concern employees are needs to permission for the utilization of electrical requirements from maintenance department and management representative that is both the parties jointly provides permission for electrical utilization, the system is deployed that the requirements of monitoring and controls on each activities are conducted to concerning electric utilization for safety point of view, because on after the permission, maintenance department and management representative is activities monitoring on activities are conducted during at the places where activities and utilization permission is granted, and the monitoring and controls are needs to conduct for safety of each employee working at that place. 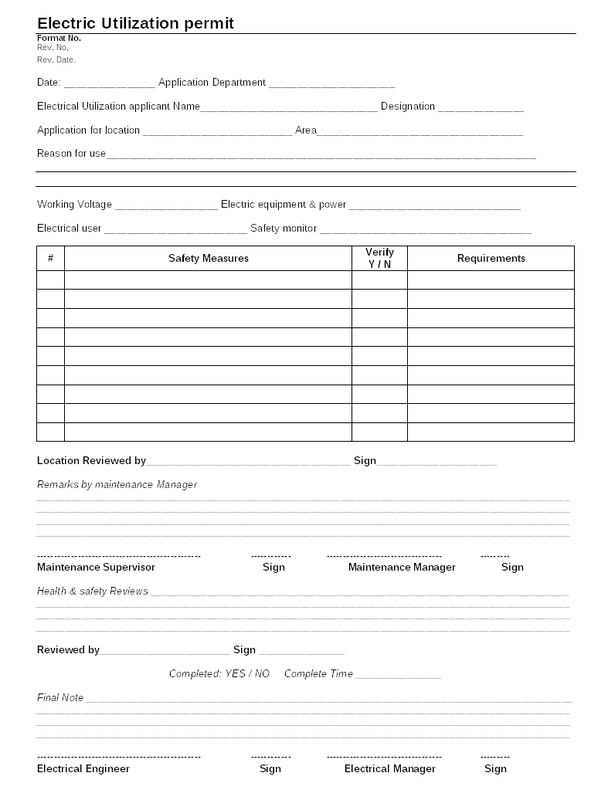 Electrical utilization permit are granted on base of the reviews by maintenance department and management representative, the document is verify for the safety purpose, the electrical utilization can cause any incident / accident at the work place if the proper activities, safety precaution and safety measures are not maintained properly, so maintenance department is reviews the document for grant permission. In the reviews generally verify the safety measures are, installation of wiring are managed by valid electrician which is authorized to managed and installation of wiring and strictly managed wiring according with regulation on electrical safety operation and technical requirements. The most important is the operators should be fully personal protective equipment wear during any operation and other requirements that directly cause incident / accident are verified by maintenance department.